When you consider all of the trees that are grown for street plantings in the urban landscape, you will quickly come to realize that the number of possibilities can be quite small because of poor soil conditions and exposure. Our streets used to be lined with gorgeous, vase-shaped elms…until Dutch elm disease came along. The ash tree was a popular and drought resistant species…until emerald ash borer came along. Of course it was a mistake to plant so many of one species (or one cultivar). We weren’t thinking about how easy we were making it for pests to spread and infest trees along these long, continuous rows. The Norway maple (Acer platanoides) has been a successful street tree, lining several streets and providing shade and habitat in several cities in Canada and the US. Norway maples tolerate pollution, hot, dry conditions and a wide range of soil pH’s which make them a very important and successful street tree, sometimes where little else would grow. It was recommended by the ministry of natural resources and grown in their nurseries. The problem is that the uncultivated (original) species produces large amounts of seed and those seedlings are very shade tolerant and therefore may spread into naturalized areas. For decades now, North American nurseries have been offering a wide range of cultivars of Acer platanoides, and these cultivars differ significantly from the original species. 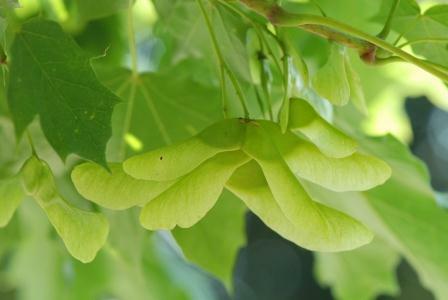 Norway maple (Acer platanoides), the original species, developing seed. As you know, the Norway maple species has become labeled as an invasive species in some parts of North America. There are some groups that feel it should be illegal to grow and plant Norway maples here in Ontario. Most recently, the Invasive Species Act was developed to help reduce the spread of invasive species. Part of the strategy includes efforts to stop the production and sale of several commonly used ornamentals in Ontario. Some of these are key urban landscape and green roof plants. Many horticulturalists are concerned that there is insufficient scientific criteria used to classify these as “invasive species” and hope that there will be exceptions where appropriate. We used to be able to plant some native maples in urban landscapes decades ago…until residential properties became so small and were graded with such poor soils that many native species will not survive, or will never reach their full potential and often become a hazard. The truth is, many urban landscapes are so disturbed, they won’t support populations of native plants anymore. And what do homeowners want to buy when it comes to planting trees in their yards? It probably won’t surprise you to know that one of the most popular trees purchased are those “red-leaved maples”. They want red-leaved cultivars of Norway maple (e.g. ‘Crimson King’, ‘Royal Red’). These selected cultivars of Norway maple differ in flower number, seed quantity, germination time, and seed viability from the original species. By knowing which cultivars which provide the lowest viable seed, we can make more informed choices and reduce the impact to natural ecosystems. Research conducted at Penn State University evaluated several cultivars of Norway maple and the original species. They found that some cultivars of Norway maple pose a much smaller risk to our natural areas. Norway maple, the original species, produces copious amounts of seed and a large proportion (75%) of that seed is able to germinate and produce another tree if it finds suitable conditions. But there are some cultivars (e.g. ‘Crimson King’) that will produce < 10% the amount of seed that the original species does – and that seed is quite low in viability (10%). That means that ‘Crimson King’ has less than 1% viable seed than the original species does. 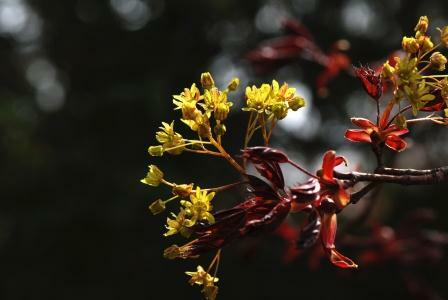 Flowers of Acer platanoides ‘Crimson King’. When we do the math we see that ‘Crimson King’ has less than 1% viable seed compared to the original Norway maple species. Of the many different cultivars of Acer platanoides, research indicates that there are some that are less invasive. ‘Crimson King’, ‘Faasen’s Black’ and ‘Globosum’ all produce the fewest amounts of flowers and therefore the least number of viable seeds. Not only do ‘Crimson King’ and ‘Faasen’s Black’ produce lower numbers of seeds, the seed also has the lowest rates of germination. “Crimson King’ and ‘Globosum’ also have a significantly smaller canopy than the species. Norway maple cultivars with lower germination, seed number and flower production may be worth investing in if the site is a stressful urban one. By planting them away from naturalized areas and using them in plantings that are diverse in species, some cultivars of Norway maple can help build our urban % forest cover while posing very little invasive threat. It is also important to note some newer cultivars that have been developed for street tree use in eastern North America. Acer platanoides ‘Medzam’ (a.k.a. the MEDALLION maple) is was developed as a virtually-seedless cultivar of Norway maple has been available on the market for a few years now. Although the mature leaves are dark green, newly emerged leaves have a lovely bronze edging to them. Like the original species, ‘Medallion’ can handle hot and dry urban conditions as well as pollution. For those that are looking for alternatives to Norway maple, Acer rubrum ‘Franksred’ seems to be doing well as an urban tree where soil pH isn’t too high. Keep in mind that any Acer rubrum will struggle on soil pH > 7.2. 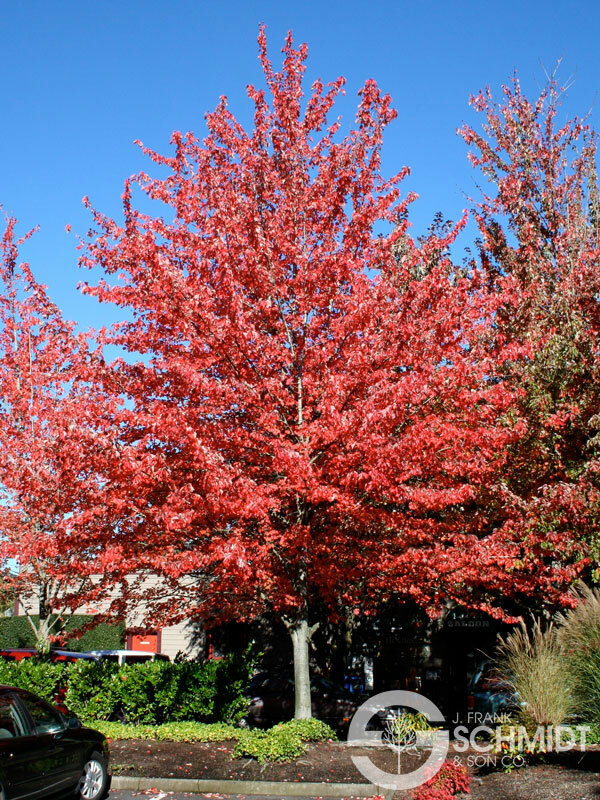 Known as the RED SUNSET maple, it can tolerate several soil types and has intense orange-red colour in the fall. There is also Acer x freemanii ‘Morgan’, also known as the INDIAN SUMMER maple. ‘Morgan’ is a cross between Acer saccharinum and Acer rubrum which gives it tolerance to periodically wet soils, a wide range of soil pH and has showy fall colour. And if a columnar form is what you’re after, Acer rubrum ‘Red Rocket’ and Acer saccharum ‘Barret Cole’ (a.k.a. APOLLO maple) are two options for smaller specimens that have some tolerance urban stresses. Conklin, J. and J. Sellmer. 2009. Flower and seed production of Norway Maple cultivars. Hort. Tech. 19: 91-95. Conklin J. and J. Sellmer. 2009. Germination and seed viability of Norway Maple cultivars, hybrids, and species. Hort. Tech. 19: 120-126. This entry was posted in Invasive Species and tagged James Sellmer, Janine Conklin, Jen Llewellyn, norway maple, ontario invasive species act. Bookmark the permalink.